For me there are two main difficulties when gathering images of the Northern Lights. One of them is being outside when they are active and the other is the post processing of the images once they are acquired. Getting the image is not such a struggle these days if the lights are flying, but, once gathered…what do you do with them? What colors should they be? How much color is too much? Much of what comes into play after the image is acquired depends on each photographer’s personal tastes. Some prefer strong saturated colors while others prefer a more subtle approach but the question remains, what color are they?? 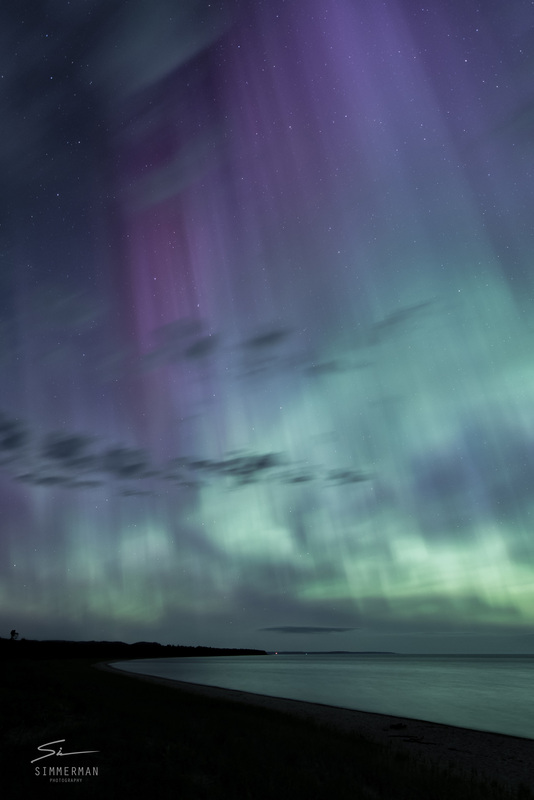 In my life I have only seen definitive color during an aurora show once. I think it was 1994 or 1995 and the display of light was intense and the patterns were mind boggling. I distinctly remember seeing green and red colors in those patterns, there was no mistake about it. I don’t know how many times that I have seen the Northern Lights but I do remember how many times I’ve been able to see a definite color to them–exactly once. The most recent show that started on the 22nd of June and ended in the AM hours of the 23rd was amazing. Patterns, pillars, curtain effects, even motion directly overhead, all a testament to the strength of the show but, to my unaided eye, well, they looked like a dull bluish\greenish\grayish white…if that is even a color! The point is, given how the eye works with it’s cones and rods and how the camera works with it’s incredible light gathering properties during a long exposure, it should come as no surprise that to the naked eye, in many cases, there are simply no colors to be seen and those that are seen are often barely noted, mere hints of their true nature. A recent discussion with a publication entity who shall remain nameless left me a bit confused as they refused to publish an image without an accompanying unedited file to ensure that “…the image submitted is what the human eye would see…”. I found this a bit odd as, without question, there is no way that the human eye will see anything even remotely like what the camera captured, a fact well documented in the literature regarding the capture of aurora. The patterns of light, sure, they would be similar, but it is unlikely that a 75 MB RAW image file, exposed for a time of twenty seconds, would in any way, shape, or form give us ‘what the human eye saw’. The Naked Eye–Bringing what the camera captured closer to what the human eye might see. Another concern expressed was that the images might be manipulated by an image editing program and as a result have over saturated and non realistic colors that, again, are not what the eye would see. I think we have all seen some of those over saturated color drenched images that may be a bit over the top and while I don’t prefer that style I have certainly done my share of them and no, you don’t get to see those! We are all different and that’s what makes this all work. The world would be a boring place if we all did the same thing. The irony here? You would have to use an image editing program in order to edit the image to make it appear closer to what the naked eye would see. While I see their point and can appreciate and respect journalistic integrity as far as journalistic photography is concerned, I cannot agree to the extent that the naked eye and a camera sensor or film will capture the same thing when it comes to a five, ten, twenty, or even thirty second long exposure time–it simply doesn’t happen like that. I freely admit that I use image editing programs to put the final touches on images that I gather. In the case of the aurora I try to express not only what I saw, but what I felt–they are a truly remarkable phenomena to experience and I still find it hard to believe that the human body can endure that much adrenaline for that length of time! With all of this in mind, I have used this particular image as an attempt to get closer to what the unaided eye might see out there. I’ve toned the colors down quite a bit, trying to match-and probably failing–the exact color (or lack of it) that I witnessed for those four hours on the beach.